Digimon: System Restore: Data Squad Episode 25: Kurata's Revenge! There are a lot of annoying things about this episode. Established facts continue to be repeated as points are hammered home. The episode covers maybe ten minutes of actual action; it's a good thing Gizumon XT was actually defeated or we'd be making Dragonball Z comparisons. The acting is frequently overwrought, an easy flaw to make with such a dramatic situation, and all the corny “Digimon have hearts too” speeches don't help. At the same time... are we not on the brink of the most intense plot in the franchise? We've had several villains seeking total annihilation. Apocalymon, Lucemon, Quartzmon... for all intents and purposes D-Reaper as well. These guys seek to reduce one or both worlds into complete nothingness. All of them are terribly powerful and all of them are the final bosses of their respective seasons. Yet when it comes to the intensity of both plot and our level of hatred, none of these compare to Kurata, a very mortal human that isn't close to the last enemy the Data Squad will face. What sets Kurata apart is his discrimination. None of these other villains care what they are destroying. For various reasons (self-loathing, programming, cleaning the slate, etc. ), they want to wipe out everything. That's terrible, but it's also clean. It's fair. They're equal-opportunity annihilators, and Apocalymon was even willing to take himself out too. Not so with Kurata. Far as we know, he wants humans to live. He wants the Digital World to continue to exist. He wants to commit total genocide on Digimon. Humans live, Digimon die. The fact he picks and chooses the targets is even worse than the fact that he has targets to begin with. The other factor that makes Kurata such a nasty villain is that he isn't predisposed to such a role. He's not classified as a virus type, nor does he have a name derived from any demons or evil gods. He's a human being that presumably has a soul and a conscience. Belphemon-related ulterior motives aside, he actually thinks he's doing what's best for mankind. He's also shaped the conversation in such a way that it's hard to say he isn't... at least if you're as narrow-minded as someone like Hashima. Kurata also has all the physical limitations that come with being human, which mean technological constructs such as the Gizamon that take care of the dirty work. And as technological constructs, they break all the rules of evolution, attack power and consequences of death. In these, Kurata ascends from mere human to malevolent god. Going in the other direction is the dying Merukimon. 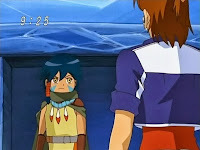 As the blast from Gizumon AT courses through him, he seems to have found spiritual enlightenment and he's trying to pass on what he can to Keenan. The combination of recalling his friendship with Spencer with the troubling ambitions of SaberLeomon and Gotsumon have made it clear to him that not all humans are evil and not all Digimon are good. Keenan never knew Spencer, but his friendship wth Marcus is a good parallel that Merukimon uses to teach this. While Keenan failed to heed Frigimon's words to not hate humans, now that he's older with human friends he can better take those words to heart. 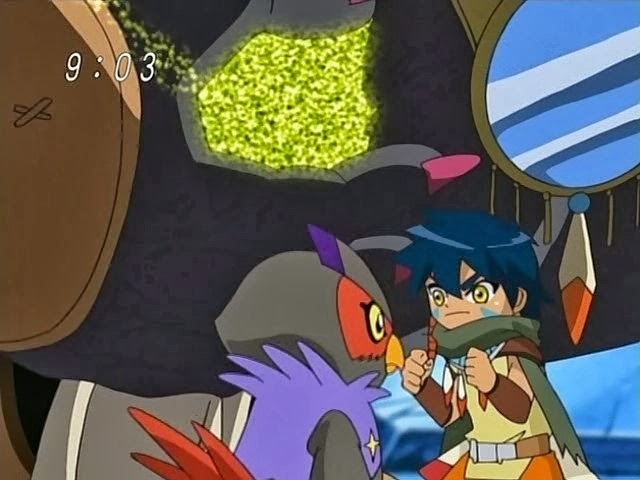 Clearly, just as Keenan viewed Frigimon as a mother, he sees Merukimon as a father. One that learned from his mistakes, tried to lead by example and gave his all for the cause, going so far as to severely damage Gizumon XT in exchange for a hastened, certain death. 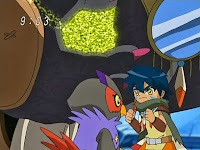 This time, the parental advice sinks in, and Keenan embraces the human-Digimon partnership. No matter how strong the technological golem is, it won't stand up to a new evolution borne from this kind of grief. So yeah, guns, guns, guns all over the place in this episode. Somewhere on Spiral Mountain, Puppetmon is crying foul. What did not escape dub editing was Peckmon's evolved form. Usually there's no sense wasting our breath over dub name changes, but Yatagaramon is based off Yatagarasu, a bird from Shinto mythology representing the (suddenly very significant) concept of regeneration, heralded all over Japan, including in the crest of their national soccer team. Crowmon is named after crows. Intense as it may be, everything Kurata stands for is so evil that it drains nearly all the nuance out of the conflict. Beings with hearts vs. heartless automatons, peace vs. war, proper melee battle vs. hiding and sneak attacks. Merukimon took all the gray area out with him. 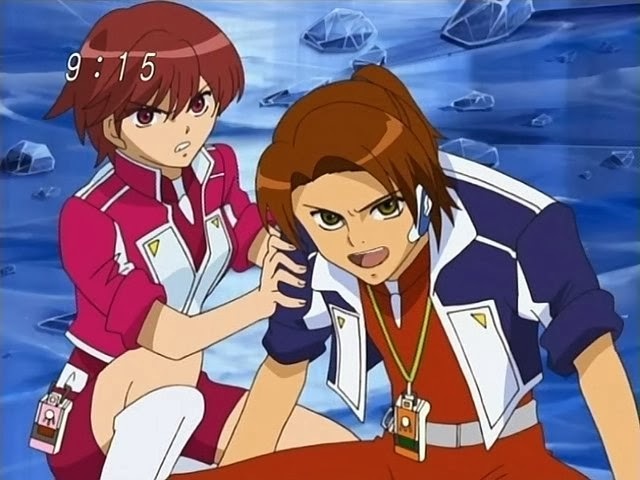 Kurata claims that since the Data Squad has rejected his offer, he's ordering Gizumon AT/XT to kill their Digimon. Gizumon gets several opportunities but continues to prefer its non-lethal weapons. This is obviously because there's no story with the main Digimon dead, but the fact that there's no good reason they're still alive is a bit of a disconnect. Keenan seems to have better command of English following Merukimon's death. He still has a long way to go, but it's a small indicator of his new empathy with mankind. Yeah, idk, i would take lucemon again over kurata.... and i really hate lucemon. no, seriously, f that guy.